A boomerang is an aerodynamically shaped object designed to fly efficiently through the air when thrown by hand. The term usually refers to an object made to follow a circular flight path that returns it to the thrower. (Some sources describe all aerodynamic "throwing sticks" as boomerangs, separating them into "returning" and "nonreturning" categories.) Traditional designs are V-shaped, but newer versions may have irregular shapes or more than two arms. Two design components give the boomerang the capability of circular flight. One is the arrangement of the arms, and the other is the airfoil profile shape that allows the arms into wings. During flight, the boomerang spins rapidly (about 10 revolutions per second). The wing profiles create the same lift effect that makes airplanes fly. In addition, the spinning motion creates gyroscopic precession, which pulls the boomerang into a circular path. A similar effect can be seen with a spinning top: if the top's axis is not quite vertical, the upper portion of the toy travels in a circle around the axis. For a successful flight, the boomerang must also be thrown correctly. It should be held near the end of one wing with the top (curved) surface facing the thrower's body. The boomerang should be almost vertical, with the thrower holding the lowest arm. Depending on wind conditions and the design of the particular boomerang, the upper portion may be inclined up to 30° outward. After drawing the arm backward, the thrower hurls the boomerang with an overhand motion, much as a pitcher would throw a baseball. At the moment of release, the thrower adds a snap of the wrist, as if cracking a whip. The release angle should be between horizontal and 15° above. If there is any breeze, the boomerang must be thrown between 30° and 90° to the right of the on-coming wind (or to the left for a left-handed thrower; right-and left-handed boomerangs are mirror images of each other). As the boomerang flies forward, it begins to slowly roll over (counterclockwise for a right-hander), ultimately flying horizontally with its flat side down. When it returns to the thrower, it is caught safely at chest height, trapping it between open hands in a sandwich fashion. Recreational throwers simply enjoy playing a solitaire game of catch. Those who are interested in competition can choose from a variety of events, including precision (returning as close as possible to the launch point) and endurance (making the most catches in a five-minute period). The inter-national record for distance traveled before returning to the thrower is 780 ft (238 m), in a flight that lasted nearly 22 seconds. The record for maximum time aloft (MTA) is two minutes, 59.94 seconds; the unofficial MTA record, which was witnessed but not thrown in a sanctioned competition, is an astounding 17 minutes, six seconds. Boomerangs developed as a refinement of carved throwing sticks (kylies) that were used as weapons, primarily for hunting. The oldest kylie found to date is one formed from a mammoth tusk. Discovered in Poland in 1987, its age has been carbondated at about 20,300 years. This 2-ft (60-cm) long, 2-lb (0.9 kg), gently curved implement was probably thrown to kill reindeer. A plastic replica of it has been found to travel an average of 90 ft (27 m) when thrown, although throwing it into a head-wind increases its range to an average 123 ft (38 m). Kylies were used by prehistoric people in all parts of the world. Usually made of wood, they were banana shaped; both faces of each arm were carved into curved, airfoil surfaces. When thrown, they traveled parallel to the ground for distances up to 650 ft (200 m), spinning furiously toward their target. Typically 3 ft (0.9 m) long and weighing 5-10 lb (2.3-4.6 kg), they were effective hunting tools. There is some evidence that boomerangs were developed in several cultural groups. For example, a boomerang-shaped object found in Germany was made of ash wood. Carbon-dated to an age of 2,400-2,800 years, it is preserved enough to allow archaeologists to reconstruct its entire shape. The replica has been thrown left-handed to produce a complete boomerang trajectory; however, the wing profiles were less than optimal, making it difficult to throw successfully. Evidence suggests that boomerangs may also have been developed in Egypt and India. In all areas except Australia, hunters devised spears for throwing and bows for shooting arrows, and they stopped using kylies. The Australian aborigines, however, continued to hunt with throwing sticks. Experimenting with designs, the residents of the eastern and southern parts of that continent developed boomerangs, which they used primarily for sport. At major tribal gatherings, they held competitions based on such qualities as the precision of the return and the speed and quality of the flight. Boomerangs were not thrown at animals of prey, although they were sometimes thrown as decoys to lure birds into a net. The oldest boomerang found in Australia dates to about 14,000 years ago. The origin of the word is uncertain, although it may derive from the cry "boom-my-row" ("return, stick") that British colonizers heard Dharuk tribesmen shout when throwing the instruments in 1788. The traditional method for making a boomerang was to select an appropriately curved piece of wood, usually from the section where the tree trunk joins a large root, making an angle of 95-110°. If necessary, the angle between the wings was adjusted by heating the boomerang over a fire and bending it. The aerodynamic profiles were carved from the wood with an axe, smoothed with a flint, and polished with sand. Designs might be carved into the surfaces, either for decoration or to improve the flight characteristics. The wood was sealed with fish oil or paint. Boomerangs remained a relatively obscure curiosity until about 1970. A workshop about how to make and throw boomerangs was presented by the Smithsonian Institution in Washington, DC. It sparked great enthusiasm for the sport, and the Smithsonian began sponsoring annual tournaments on the National Mall. The first international championship tournament was held in 1981. A wide variety of materials can be used to make a boomerang. Wood remains one of the most popular because it produces good results, is relatively inexpensive, and is easy to work. Generally preferred is aircraft-grade Finnish or Baltic birch plywood, which is laminated from very thin layers of wood. A 0.2-in (5-mm) thick sheet will have between five to 10 layers. To protect the wood from moisture, it is usually sealed with a polyurethane coating. Among the synthetic materials that may be used for boomerangs are polypropylene, acrylonitrile-butadiene-styrene (ABS) plastic, fiberglass, carbon fiber, linen-phenolic resin laminates, and Kevlar para-aramid fiber. Toy boomerangs made from urethane foam or cardboard can be used indoors. Because proper spinning action is crucial to the performance of a boomerang, there are some fundamental concepts that must be followed during the design process. However, those basic elements leave a great deal of room for creativity, and boomerang makers frequently experiment with innovative shapes. sturdy paper. This first guide mark denotes the center of gravity of the boomerang. As the designer continues to sketch the boomerang, he or she must take care to balance the shape around the center of gravity point. The other important consideration is that the centerlines of each wing of the boomerang must point generally toward the center of gravity (i.e., within 10° in either direction). So the second set of guide marks the designer makes on the paper are the centerlines of the wings. Within the limitations set by the guide marks, the designer can then sketch as basic or whimsical design as desired. After the design is completely drawn, the designer cuts it out from the sheet of paper. By hanging the pattern successively from the end of each wing, the designer can verify that the planned center of gravity has been adequately preserved. This will be true if the centerline of each wing hangs within 30° of vertical. Serious designers who seek more precise methods can use more sophisticated techniques, including computer-aided design software. The following description focuses on making a V-shaped plywood boomerang. Synthetic materials are worked in a similar manner, but some generate dangerous dust or fumes when being cut or sanded. In this case, dust masks and protective clothing are essential. 1 The plywood sheet is checked for flatness. If it is not completely flat, it is oriented so the concave side will correspond to the top surface of the boomerang. This significantly increases the boomerang's strength, and it raises the wingtips slightly for better aerodynamics. 2 The pattern is placed on the plywood so that the wood grain runs across from the tip of one arm of the boomerang to the tip of the other arm. The outline of the pattem is traced on the plywood with a pencil. 3 A scroll saw, jigsaw, coping saw, band-saw, or fret saw is used to cut the boomerang shape out of the plywood. This basic cutout is called the blank. 4 As an alternative to cutting a single-piece blank, two separate wings can be cut, allowing a section of overlap where they will be joined. Using a router, half the thickness of this overlap section is cut away from each wing. The overlapping sections are joined with wood glue and clamped together until the joint hardens. 5 An outline is drawn on the top of the blank to show the areas to be shaped for the leading and trailing edges of the wings. 6 The profiles of the wings are shaped with a belt sander or by hand with a rasp or a plane. The top of the leading edge of each wing is decreased at a 45° angle, while the rear of the wing is angled down to leave a 0.04-0.08 in (1-2 mm) thick trailing edge. The bottom face of the leading edge is cut back slightly. The tips of the wings are shaped down to the same thickness as the trailing edge. The various layers of the plywood serve as contour lines that help the worker achieve uniform slopes. 7 A shallow section may also be cut out from the bottom surface of each wing. For example, this might consist of a 2-in (5-cm) long strip near the wing tip and behind the leading edge. 8 Using progressively finer (80-250 grit) sandpaper, the surface of the boomerang is smoothed carefully with an orbital sander or by hand. 9 After spraying the surface with sanding sealer, fine steel wool is used to further smooth the surface. A coat of paint or wood stain is followed by one or more coats of clear polyurethane finish. 10 The boomerang is thrown several times to test its flight capabilities. Several types of adjustments may be made to tune the boomerang for better performance. For example, the wing profiles might be adjusted by additional sanding. 11 Another tuning technique is to bend the wings, raising their tips about 0.12 in (3 mm) above the plane of the vertex; this is called giving the boomerang a positive dihedral. It may be necessary to heat the boomerang to make it flexible enough for bending and to make the adjustment permanent. This can be done with steam or even in a microwave oven. 12 Twisting the wings to raise or lower the leading edges can also affect the boomerang's performance. 13 Other tuning techniques include drilling holes through the wings, cutting slots in the leading edges of the wings, or drilling shallow holes into the underside of the wings and inserting lead or brass plugs to add weight. Throughout the manufacturing process, the quality of the boomerang is periodically checked. Any unevenness in the boomerang such as unequal sides or bumps will take away from the aerodynamic design. Boomerangs are sanctioned by comities such as the World Boomerang Association and the United States Boomerang Association (USBA). These groups set the standards and rules that any boomerang competitions must adhere to such as safety, skill, and timing. Boomerang innovations can be developed in two areas: materials and design. As new materials are developed that are strong, durable, and lightweight, boomerang makers will try using them individually or in combination. For example, the boomerang that flew for more than 17 minutes consisted of a two-layer outer shell of carbon fibers and Kevlar; the shell was filled with epoxy resin mixed with phenolic microballoons. Two recent innovations suggest ways that designs can be modified to improve aerodynamics. 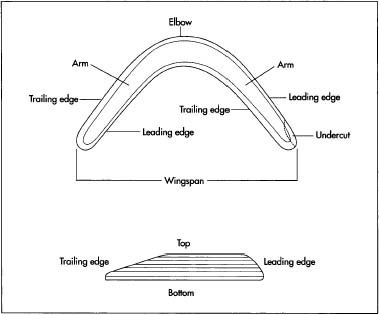 One involved making the upper and lower surfaces of the trailing edges of a boomerang's wings slightly concave. Normally, these surfaces are flat or slightly convex. This design was used for the boomerang that set the current world record for distance. In the other example, a boomerang's wing tips were cut at an angle that made them perpendicular to imaginary lines leading to the center of rotation. Usually, the wing tips are perpendicular to the centerline of the wings. This modification was created by the holder of the unofficial MTA record. Mason, Bernard Sterling. Boomerangs: How to Make and Throw Them. Mineola, NY: Dover, 1985. Drollette, Daniel. "Field Notes: Return to Sender." The Sciences (May/June, 1998): 16-19. Lane, Marke. "Classic Boomerang." Work-bench (June/July 1996): 36. Valenti, Michael. "The Return of the Boomerang." Mechanical Engineering (December 1993): 68. Amateur Boomsmith. http://www.uku.fi/-hniskane/workmain.html (October 27, 2000). What a touching post. That's one of my faotrive things about food. Smell, to me, is the most nostalgic sense, and so much of tasting is smelling. I was with friends at the French Laundry last week and of all the excellent courses, the one that actually brought me close to tears was an endive with orange and onion that tasted exactly like the best holiday relish I'd had as a kid growing up in New England. It was impeccably prepared, totally simple, and delicious.Also, these cookies look great!